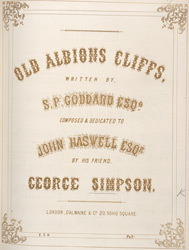 Patriotic songs were popular during the mid 19th Century. Politics at this time were preoccupied with war. The Crimean War raged from 1853- 1856, then there was the Italian War in 1859 and another war in 1866. Songs supported these campaigns, usually praising the politicians and always glorifying the soldiers who fought, defending the nation's interests. Songs praised bravery and heroism and were embellished with dramatic prose and mournful tunes.